Deals are heating up at Wilkins RV! 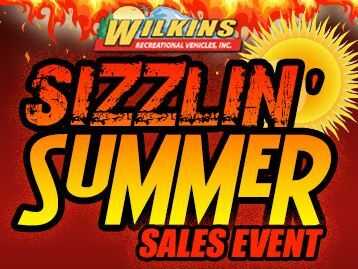 Our Sizzlin’ Summer Sales Event is happening right now… Don’t miss out! Contact dealer for financing terms. In addition to our Sizziln’ Summer Sale Specials, we are also offering over 60 Heartland Fifth Wheel RVs On Sale at huge savings until the end of July. We are overstocked on these amazing products. Heartland RV has been a leader in fifth wheel manufacturing for years. Now is your chance to get a quality fifth wheel at an amazing price. Take advantage of the limited time manufacturers rebate of up to $4,000 on a new Heartland fifth wheel in this special overstock sale! With the largest selection of RVs at the lowest prices, no one beats Wilkins RV! But don’t wait… this special summer sale is only available until July 31st, so hurry in and get the RV you’ve always wanted. Contact Our Dealership for additional information on RV sales and special promotions or visit us at One Of Our Convenient Locations. Summer has just begun. Spend the rest of it having RV camping fun!